Hi friend! I hope you’ve been having a beautiful week. I’m still rocking the smoothies this summer and wanted to share one of my prettiest, tastiest, and most beautifying recipes with you today. You might be wondering “Cait, what’s with all the pureed food you eat?” Well I’ve always had a hard time with the textures of certain foods, which is likely not unconnected to the fact that my mother pureed my food until I was 3, god love her. With that weird texture issue in mind smoothies are the perfect way for me to get a huge hit of veggies I otherwise avoid due to their “icky” or “squeaky” texture in my mouth, I’m looking at you cucumber and zucchini! 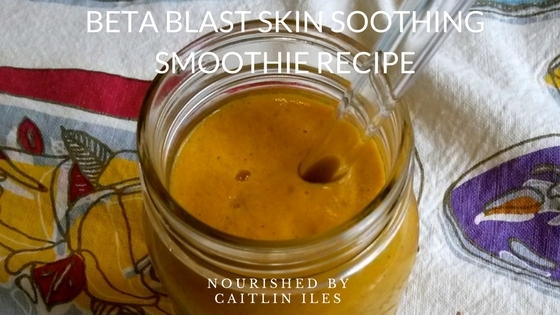 I created the Beta Blast Skin Soothing Smoothie with my wonderful sister in mind because she was always making smoothies out of carrots and ginger that were just absolutely beautiful. So Bear, this one’s for you. This smoothie is amazing for skin, hair, and nail health thanks to its huge dose of beta-carotene, an antioxidant and the precursor to vitamin A in our bodies. BC shows up in foods that are a vibrant orange colour, such as pumpkin, carrots, and cantaloupe. It’s also present in pretty high amounts in leafy greens, though the chlorophyll content tends to mask the orange hue. I also added cucumber to this bad boy because the mineral silica is necessary for building healthy and strong connective tissue, such as muscles, bones, tendons, ligaments, and cartilage, in your body. Silica is also super important for radiant skin, shiny hair, and strong nails, so incorporating foods rich in this mineral into your diet will truly help you glow from the inside out! I’ve also been experimenting a lot with different fermented foods, so I added some of my homemade coconut milk kefir for a hit of probiotics and healthy fats to keep my tummy happy and my skin glowing! If you don’t have coconut milk kefir/yogurt straight coconut milk or almond milk will work just perfectly! Finally, I added a little fresh ginger to aid in digestion and turmeric to help modulate inflammation in the body and promote detoxification. Pour into a mason jar and enjoy! Hint: If not using any frozen fruits add 1 cup of ice cubes to make this bevvie cool and creamy! Well that’s all for today friend. What’s your favourite smoothie? Do you have any delicious concoctions you would want to have featured on the blog? Let me know in the comments! And if you’re looking for more sweet smoothie inspiration then make sure you download my FREE Sensational Summer Smoothies E-Book right here. Have a wonderfully whimsical week!